Posted October 16, 2018 by Town Hall Terrace & filed under Grand Island. If you’ve spent much time in Western New York, you may already know that our region is well-known for the warm, friendly demeanor of its citizens. In our community, it’s not uncommon to see people helping their neighbors shovel snow from the latest blizzard or lending a hand with their gardens in the summertime. Buffalo has long been known as the City of Good Neighbors, but it recently earned another unique distinction from the popular Travel and Leisure Magazine. 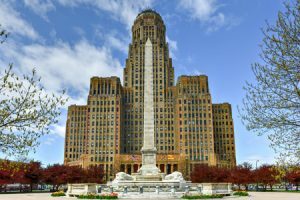 Based on the results of its annual America’s Favorite Places survey, Travel and Leisure has named Buffalo America’s Friendliest City. Even Buffalo Bills Hall of Fame running back Thurman Thomas weighed in on the results of the survey in a recent interview. To celebrate Buffalo’s recognition as the nation’s friendliest city, Thomas teamed up with Cheerios this morning to serve a free breakfast to fans at Fountain Plaza. The city is also commemorating the occasion by making parking meters free for the day and lighting the Peace Bridge yellow in the evening. Interested in joining the famously friendly community of Western New York? We’d love to have you join us here at Town Hall Terrace! Browse our homes online or give us a call today to learn more!